Business Security Solution : Small Business isn't so Small When It's Yours! Business Security Solution : Small Business isn’t so Small When It’s Yours! The ZKTeco stand-alone biometric readers offer a cost effective and manageable solution to improved access control and time attendance to your business, inventory or customer records. Biometric enrollment is fast, has greater integrity, lower operating costs (no cards to lose or replace) and has audit trail capabilities forbusiness owners. Video surveillance provides “eyes in the back of your head” to help a busy entrepreneur stay on top of their business operations and security. The ZKTecoVideo Surveillance systems offer a wider variety of cameras and accessories using high quality IP megapixel video cameras at very affordable pricing. Wisma BSG Building is an office building located in Jakarta, Indonesia. The client requires a system that can identify each personnel as they enter the building. Authorized members can only access registered floors. This includes both the visitors and the worker of the company in the Building. The admin of the building can register access privilege of the employees’ ID card by ZKAccess software and allocate to the companies in the building. When the employees receive their ID cards, they can use the elevator and access to authorized floors. 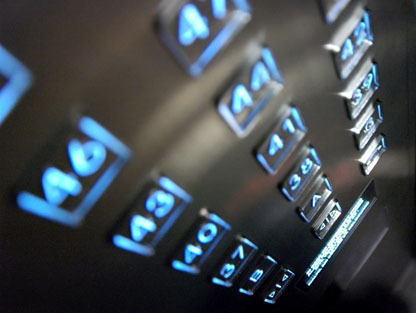 The KR600 installed in the elevator will read their ID card, then EC10 panel will lead the employee to their authorized floors by inputting signals to the elevators. This can prevent unexpected people accessing other companies’ facilities and assets. For visitors, if they would like to visit certain floors of the building, it is essential for them to first register at the reception area. The visitor management system in the ZKAccess software will record visitor information including their photos, names, contacts etc. Afterwards, visitors will receive the authorized ID card. With the card, visitor can only access to their designated floors. The system can also record all the users’ visiting records and can be export from the software. Once there is any emergency or accident, admin can check the data and trick the behavior of suspicious people in the building.